Home > Blog & Resources > Industry News > Ultra-Sleek TMC Dumont Motorcycle Has Rolls-Royce Aircraft Engine! 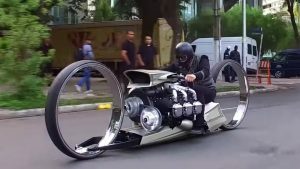 The idea of strapping an aircraft engine to a motorcycle isn’t quite new; we have seen plenty of concept bikes experimenting with this idea in the past. But the TMC Dumont with “the largest wheels ever made for a motorcycle” is like nothing we have seen ever before. The TMC Dumont is the work of Brazilian ex-Formula One driver Tarso Marques. After his retirement, the former Minardi driver took to building custom motorcycles under the moniker TMC. The latest of his creations is the TMC Dumont. The bike is powered by a massive 300-hp six-cylinder Rolls-Royce engine lifted from a 60s-era aircraft. The concept bike is an intricate amalgamation of the future and the past, but what about the practicality? The gargantuan hubless 36-inch wheels are high enough to block the rider’s view. Not only that, the rider sits dangerously close to the rear wheel and no one is sure how exactly the motorcycle takes the turns.